The Fiji national team are hoping to adjust to the conditions in Manila ahead of this evening's match. 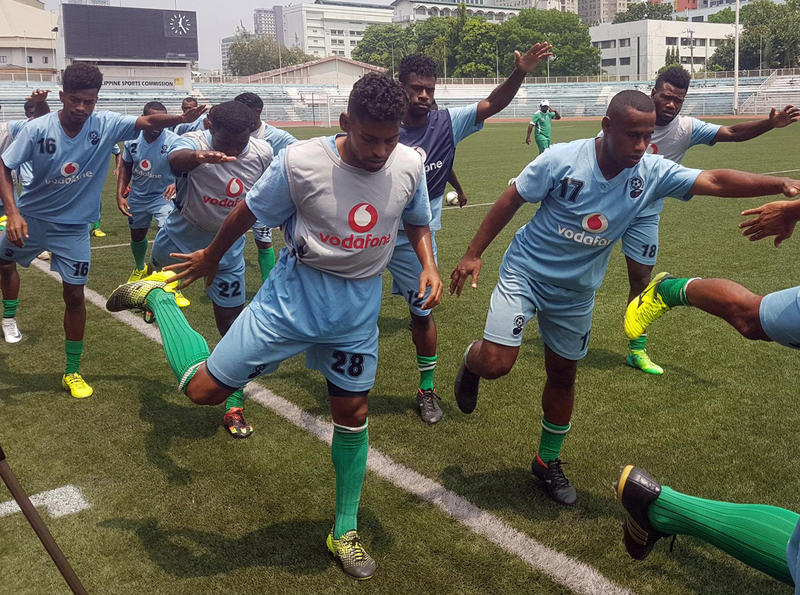 The Fiji national team are ready to put themselves to the test for the first time in 2018 when they take on Philippines at Rizal Memorial Football Stadium this evening. The international friendly is the final opportunity for Fiji’s opponents to test themselves ahead of their final AFC Asian Cup UAE 2019 Qualifiers match against Tajikistan. Currently ranked 168th in the FIFA World Rankings, Fiji is just the second Oceania side to play the Philippines who previously played Papua New Guinea in October 2014, a match AFC side won 5-0. Fiji coach Christophe Gamel said the side is slowly settling in to the conditions in Manila. “The heat is very strong and the players aren’t used to artificial turf and their feet are burning,” he explained. However they have to focus on the match at hand and Gamel is hoping that the time the squad has spent together will assist them. “We had a training session that focused on technical moves and set pieces during the match. For Philippines coach Thomas Dooley the match is very much preparation for the upcoming encounter with Tajikistan. “For us, the most important thing is to see the players have fun playing football,” Dooley said. Fiji take on the Philippines at 7.30pm (11.30pm FIJT) at Rizal Memorial Football Stadium.